The Congress Vice President targeted Doval's son a day after reports surfaced that four union ministers were serving as directors in his NGO India Foundation. NEW DELHI: Rahul Gandhi targeted National Security Advisor Ajit Doval’s son Shaurya Doval a day after reports surfaced that four union ministers were serving as directors in his NGO India Foundation. “After the huge success of Shah-Zada, a new offering by the BJP--Ajit Shaurya Saga,” Rahul tweeted. Shah-zada referred to Jay Shah, son of BJP chief Amit Shah, whose extraordinary profits had been slammed by the Congress vice president earlier. 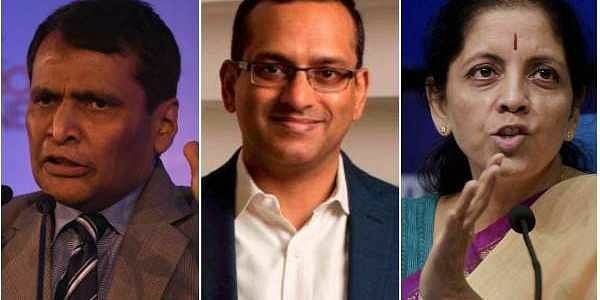 According to the report, defence minister Nirmala Sitharaman, commerce minister Suresh Prabhu, minister of state for external affairs MJ Akbar and minister of state for aviation Jayant Sinha serve as directors in the think tank India Foundation run by Shaurya Doval. “Has any cabinet minister ever served in an NGO in India’s history. Why is the PM silent? He should sack the four ministers,” Congress spokesperson and former union minister Kapil Sibal said, adding that Prasar Bharti chairman A Surya Prakash and BJP leader Ram Madhav were also working for the NGO. He said if a similar charge had surfaced during the UPA rule, demands for registering an FIR would have come and the parliament would have been disrupted. Terming four BJP ministers serving India Foundation as a direct case of conflict of interest, Sibal cited the example of Sonia Gandhi, who resigned as chairperson of the National Advisory Council and got herself re-elected when the then main opposition BJP had raised the office of profit issue. “Ram Madhav is a BJP office bearer, a party general secretary. He can’t be a director in the NGO. The ministers can’t be in the NGO. They do not know the law. It will result in prosecution and imprisonment,” said Sibal. The former union law minister questioned the funding of the NGO saying big international and national companies sponsored the events organised by the India Foundation. “Curious that Ministers recd permission2serve as Directors. In UPA we had2resign from charitable &non-profit boards. There is a Code of Ethical Conduct4the Council of Ministers, in force for decades, that prohibits external directorships. CabSec administers,” Congress lawmaker and former union minister Shashi Tharoor tweeted.